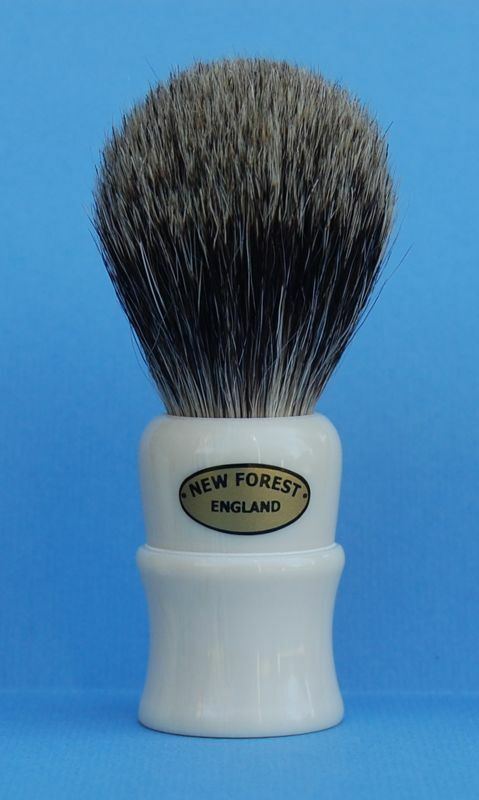 These brushes are individually turned on a lathe and shaped by hand in the New Forest in high quality alternative ivory. The brush has a 20mm knot with a 48 mm loft and 45 mm height handle with a maximum diameter of 31 mm. The brush has a firm backbone - great for face lathering with hard soaps and creams but just as good for bowl lathering. I love small and stiff shaving brushes like this, and tell me please if this brush are floppy after several uses or not? This is not a floppy brush after regular use. It does bloom, but not a lot, and remains with good backbone for face lathering. You can email me at nfbrushes@yahoo.com for any more information.